Battaglino Rettifiche Srl, has been operating on the market for over 40 years and is specialized in high precision grinding of mechanical parts and equipments. BOTTELLI Srl, Toolholders for CNC machining centers. Special components for machine tools: main spindles with or without splined profile, sleeves, parts of electrospindles which can be used on every type of machine tool. Assembling of complete units. CEIMU Srl, Established in 1984 as a small concern specializing in the construction of hydraulic plants for machine-tools. Over the years, thanks to its commitment to technical & commercial development, the Company made a reputation in the most diversified fields of machinery, where high technical and constructional expertise was required. CMI Srl, since 1978 has been designing, producing and selling mechanical units for the most representative machine tool manufacturers in Italy. Located in Lugagnano Val d’Arda (PC) in a workshop of 3000 sq m, CMI Srl means experience, knowledge, technology and skills. CO.MO.LA Srl, has been operating in the sector of telescopic covers for the most important machine tool and machining center manufacturers of the mecatronic pole of Piacenza since 1970. Co.Mo.La that runs a 3000 sq.m. factory, located in Caorso (Piacenza), is distinguished for its experience, know-how, technology and skills. DOGADO S.R.L., is an International Freight Forwarding Company established in 1988. During more than 25 years we do offer tailored solutions to the shipping demand , particularly pointed toward the metal-working and project cargo field . Our Customer will benefit of experience, flexibility and quality under the ISO9001/2008 Standards. E.T.A. SpA, located in Canzo (Co) has branches in France and in the United Kingdom and produces electric panels without wiring in varnished sheet and stainless steel for automation, control and distribution of energy in low tension. The modular cabinets, those with a single structure, the boxes, the reading desks and the pendant control systems give a good idea of ETA’s range of proposals. EOS SOLUTIONS Spa, has been a Microsoft Gold Certified Partner since 2000 and is now Microsoft's main partner in Italy for its Dynamics business management software, thanks to the team's high number of implementations and professional expertise. As a single partner offering the entire range of Microsoft Dynamics software solutions (NAV, AX and CRM) the company has gained a reputation for offering high-quality and comprehensive implementation strategies based on solid technological skills and process knowledge, a high degree of specialization, preconfigured best practices and vertical integration. EVOLUT SpA, Having first made its name as a technical partner of ABB Italia, since the early Nineties Evolut has been an independent enterprise and is today a reference point for robotic automation. FANUC Italia Srl, designs and produces technologically advanced products and CNCs for the sector of automation. The company is focused on continuous product innovation so as to offer new functionality to customers and consequently satisfy their needs in terms of improved productivity, flexibility efficiency, control of expenditure and facility in use. At Fanuc the basic principle is TECHNOLOGY AND MORE. G.N.Z. SYSTEM Srl, The company is a specialist in structural steel work and in the construction, assembly and maintenance of equipment for industrial, food and metalworking industries. In addition it produces systems for transporting and using liquefied gas. IDB Industria Dociaria Borsari Srl Gruppo Muzzi, The confectionery “IDB Industria Dolciaria Borsari” is among the major Italian companies producing Christmas and Easter Italian specialties (Panettone, Pandoro, Offella, Colomba), as well as other pastry products for special occasions. With sales in more than 54 countries worldwide, it also owns “Borsari Emporium”, a renovated store with direct selling in Badia Polesine (RO). Quality, international certifications and manufacturing accuracy make IDB Industria Dolciaria Borsari one of the main “Made in Italy” food promoting companies. IMA TECNO Srl, is a company designing and manufacturing electro spindles and heads having high quality standards, dedicated to the machine tools manufacturers worldwide in aerospace, automotive, mechanics. Alongside the activity of Multi Brand repairs and technological service and support. KENNAMETAL ITALIA SpA, is a world leading company in the metalworking and tool production sector, specialised in design, production and supply of integrated solutions, engineered components and high technology material. Companies in the most diverse sectors as aerospace, energy, automotive, railway, general mechanics and machine tools all acknowledge Kennametal’s extraordinary support in their production processes. KOMET UTENSILI Srl, Since 1918, known for its precision tools the world over. La Meccanica Industriale Srl, operates in the sector of mechanical manufacturing and precision mechanics since 1978 and has worked in different sector acquiring high technological skills and knowlege, the main feature is the continuos innovation tied to high quality and precision standards in the service offered. The team with multi-years experience is higly specialised in the production of unique piaces, small samplings and little mounted assemblies. LOSMA SpA, Invention, design and production of aspirators for mist, micro-mist, oily mist and fumes produced during machining operations on machining centers and also cleaning systems for filtering lubrication-coolant. MONTRONIX Srl, A world leading company with 30 years experience in the field of tool, machine and process monitoring which has operating and sales facilities in three continents. The quality of its products, the efficient servicing facility and the constant investments in research and development make Montronix the ideal partner for companies that want to enhance production, reduce costs and increase their competitively. NEVE MECCANICA Srl by CREMA, Specific company in the sector of design and production of component clamping devices as vices and spindles, and turning heads. O.M.G. Srl, established in the sixties as small workshop specialized in the design and manufacture of multi-spindle heads. Over the years the company became the protagonist of an important technical and structural evolution. The advanced technologies applied in production processes and the use of new computerized methods allowed to expand the production range, that now includes : angle heads, gearboxes, revolver heads and a large series of multi-spindle heads, designed on Customers’ request. PMP Srl, operates in the sector of top quality, extremely high accuracy mechanical machining and assembly in a number of industrial fields. Their mission is providing customers the best possible performances, customized products and a reliable service. 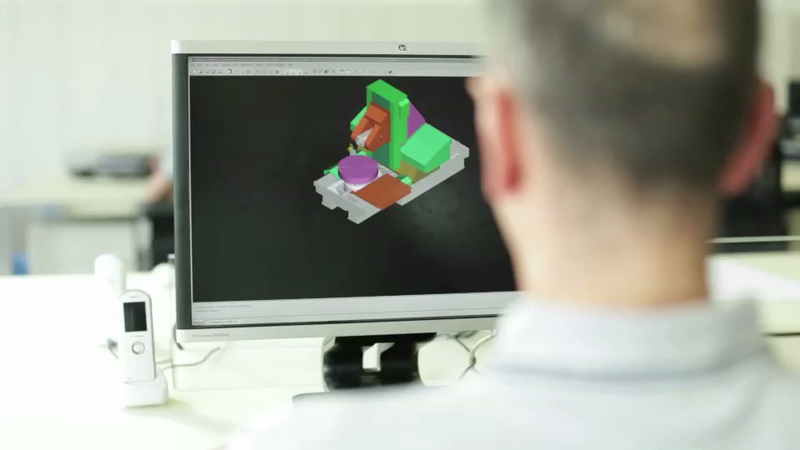 PRISMA TECH Srl, has more than 25 years of experience in engineering CAD and PDM/PLM software for the Italian manufacturing industries focused on improving the product development process. During these years Prisma TECH succeeded in maintaining and consolidating its own know-how, achieving results, as follows • Gold Partner Autodesk is one of the top ranked in Europe regarding Manufacturing field • Strong technical connotation: particularly in PDM/PLM software, Industrial Design, Simulation and Visualization • More than 1.000 customers among the best Italian manufacturing companies • 1.600 days per year for assistance and maintenance of design systems for its customers. • Partner Stratasys, a world market leader in the rapid prototyping and 3D-printers supply. Its aim is to offer to its customers a solution providing real efficiency gains and a return on the investment within a short-term period. The company has its headquarters in Bologna and subsidiaries in Padova, Milano and Torino.has more than 25 years of experience in engineering CAD and PDM/PLM software for the Italian manufacturing industries focused on improving the product development process. During these years Prisma TECH succeeded in maintaining and consolidating its own know-how, achieving results, as follows • Gold Partner Autodesk is one of the top ranked in Europe regarding Manufacturing field • Strong technical connotation: particularly in PDM/PLM software, Industrial Design, Simulation and Visualization • More than 1.000 customers among the best Italian manufacturing companies • 1.600 days per year for assistance and maintenance of design systems for its customers. • Partner Stratasys, a world market leader in the rapid prototyping and 3D-printers supply. Its aim is to offer to its customers a solution providing real efficiency gains and a return on the investment within a short-term period. The company has its headquarters in Bologna and subsidiaries in Padova, Milano and Torino. REMEC. S.R.L., is specialised in the construction of very precise mechanical fixtures, including single components, as per supplied drawings on behalf of a third party by means of electrical discharged machining and numerically controlled. RENISHAW SpA, the Italian branch of Renishaw Plc of Wotton under Edge (UK) sells probes for co-ordinate measuring machines (CMM), probes for component inspection and tool pre-setting for machine tools, gauging equipment, linear and rotary encoders, probes and machines for copying and digitalisation, Raman spectroscope systems for process/quality research and control. ROSSETTI ENRICO & C. Snc, Study, design and construction of fixtures for machine tools, mechanical constructions, turning and boring operations. Rossetti Enrico & C. S.n.c. is a modern technical centre which designs and manufacturers fixtures for machining centers. The company is always up on the most recent technologic developments with modern aids and specialised personnel in order to face the most diverse problems related to design and technology that could occur in the production of medium and large batches. The company provides support in the production of small batches of mechanical accuracy components, i.e. pre-assembled units, building of special machines, production of moulds, cams, spare parts in general as well as traditional milling and turning machining operations. S.C. SALDATURA CARPENTERIA Srl, The long experienced company has had enormous success on the international market with the construction of medium to large dimension electro-welded structural work. It has constantly been undergoing development since foundation and continues investing in infrastructures, safety and engineering. SHUTON S.A., manufacturers highly accurate ball screws from 0 16 to 0 125 mm. with length up to 12 mt. and pitch up to 64 mm. Technology and quality are always at the customer’s disposal. TRANSPACK SpA, founded in 1973, was one of the first companies in the industrial wood packaging sector to be set up as an industrial organization. The new market needs, after the strong export growth in the country, considerably increased packaging demand. TURRINI RISTORAZIONE SRL, Canteen management for companies, schools and organizations in general. Service offered to private companies and associations. The company has 30 years’ experience in the traditional catering sector in Verona and Mantova and its moto is quality and healthy food. UMBRAGROUP S.p.A., is a cutting-edge manufacturing company in the industrial, aeronautic and energy field. UMBRAGROUP is composed of six companies based in Italy, Germany and USA. Thanks to its wide range of products, today the Group is considered a global supplier in the industry, capable of meeting a variety of customer needs in the most different areas of the industrial world. These factors and technological advances have helped make the Umbra brand the preferred choice by the customer. UMBRAGROUP S.p.A. is the parent company of UMBRAGROUP, based in Foligno, Italy. Products Portfolio: ballscrews, balls, bearings, electromechanical actuators, electrospindles and milling heads. VEGHA GROUP Srl, Founded in 1981 as suppliers of wired electric panels, Vegha is currently involved in the following production areas: • Winding of coils • Mounting and assembly of electric equipment and electro-mechanical components (pushbutton panels, relays, etc. ); • Assembly of electronic control systems in the heating and conditioning sector; • Assembly of electric panels; • Sale of the relays they produce. VERTOURS Srl, member of the LUFTHANSA CITY CENTER network, Vertours Travel Agency offers Business dedicated services, in order to address all sort of needs when it comes to professionals travelling. Flights reservation with all airlines, low-cost companies included, train tickets, hotel booking and car rentals, visa applications and care of all customers’ needs. Moreover, H24 service to assist travelers facing unforeseen events and ensure the best possible comfort to those travelling around the world, no matter where they are. Self-Booking Tool, allowing everyone to self-arrange his or her own business trip through easy procedures, thanks to a dedicated web portal and qualified personnel’s assistance. Regular reporting system available, specifically elaborated and personalized, so that customers can correctly distribute their travel expenses depending on cost center, contract, product code,… in accordance with each company’s management system requirements.